Lord Burlington was the most celebrated of 18th-century England’s aristocratic amateur architects. In addition to designing a relatively small number of highly influential buildings himself, he used his position to promote the Palladian revival from the 1720s until his death. His protégés, notably William Kent, Henry Flitcroft and Isaac Ware, were inserted into senior positions in the Office of Works, from which they effectively controlled official architectural projects. Burlington’s rapid rise to the role of the country’s leading arbiter of taste meant that his opinion was solicited on many schemes in which he had no direct involvement. His interests and influence also spread well beyond the architectural field, as he gave financial and practical assistance to a wide range of musicians, writers, artists and sculptors, earning him Horace Walpole’s accolade of ‘The Apollo of the Arts’. He was a notable collector, acquiring not only Old Master paintings, but also the majority of the surviving drawings by his idols Andrea Palladio and Inigo Jones. On his death without a direct male heir, his estates and collections passed by marriage to the Dukes of Devonshire. Richard Boyle, 3rd Earl of Burlington and 4th Earl of Cork, inherited his titles at the age of 10, together with extensive estates and properties that included Burlington House in Piccadilly, Chiswick House upstream on the Thames, Londesborough in Yorkshire and Lismore Castle in Ireland. By 1714, he was already being praised in print for his taste in gardening and painting, but his first Grand Tour, taken that year as far as Rome, does not seem to reflect any particular interest in architecture. This appears to have been stirred the following year by the publication of two key works, the first English translation of Andrea Palladio’s Four Books of Architecture and the first volume of Colen Campbell’s Vitruvius Britannicus. Campbell became, for a few years, the young earl’s architectural mentor and, under his influence in 1717, Burlington made his own first design, a bagnio or bathhouse in his gardens at Chiswick. In 1719, Burlington set off again for Italy, this time with a more definite architectural focus. He spent time in the Veneto studying the buildings of Palladio, and he also began his collection of drawings by that master. Together with his subsequent acquisition of drawings by Inigo Jones, and his rapidly growing library of books on the architecture of the Renaissance and Roman antiquity, these were to provide the main source of his inspiration as a budding designer. He returned home fired with a conviction that English architecture, which was still largely in the hands of Baroque practitioners, urgently needed reform, and that the principal models should be Palladio and Jones. When he came to design his own villa at Chiswick in the mid 1720s, he placed their statues prominently to either side of the portico, like patron saints. Within a year or two of his return, Burlington’s fellow peers were already asking him for designs: in 1721, he designed Tottenham Park in Wiltshire for Charles, Lord Bruce, and a town house for the Earl of Mountrath, and, in 1722, a banqueting house for the Duke of Richmond’s Charlton Hunt. Other country-house commissions included Castle Hill in Devon, where he and his friend Lord Herbert (another aristocratic amateur) appear to have directed the architect Roger Morris, and the remodelling of Northwick Park in Gloucestershire. Perhaps the grandest house with which he was involved was Holkham in Norfolk, begun in about 1734, which seems to have been a joint effort by Burlington, Holkham’s owner Thomas Coke (later Earl of Leicester) and William Kent, with Matthew Brettingham as executant architect. Burlington was almost equally in demand for public buildings. 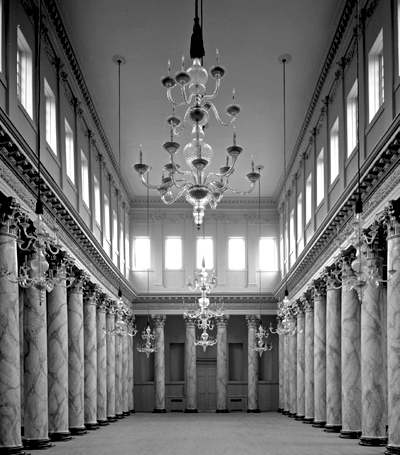 His earliest commission was a handsome dormitory at Westminster School (1722-30) and the most important was the Assembly Rooms (pictured) in York (1731-32); he also produced schemes for Sevenoaks School and the Council House at Chichester, although, in both cases, the projects seem to have been taken over by Morris. Insofar as there can be said to be a Burlington style, it is marked by a certain cool austerity on the exteriors and by a feeling for motifs (usually culled from antique, Renaissance or Jonesian sources in his own collection) in isolation. Burlington married Lady Dorothy Savile, by whom he had two daughters, but his boon companion was his boisterous fellow Yorkshireman Kent, whose career he assiduously promoted and who mostly lived in the earl’s own houses. In recent years, there has been much scholarly debate about the extent to which Masonic symbolism informs the two men’s designs (both were certainly Free-masons). It has also been suggested, more speculatively, that, despite apparently being a pillar of the Hanoverian establishment, Burlington covertly and treasonably engaged in Jacobite activities. Inevitably, the evidence is purely circumstantial.